Memorial Day is coming up, so I wanted to make something festive for the holiday. 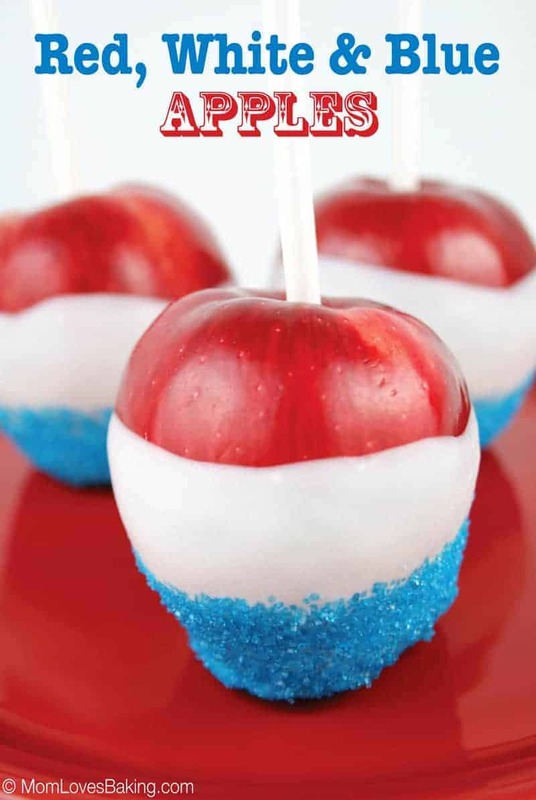 Red, White and Blue Apples are the perfect patriotic treat. Even better, they’re only 3 ingredients! 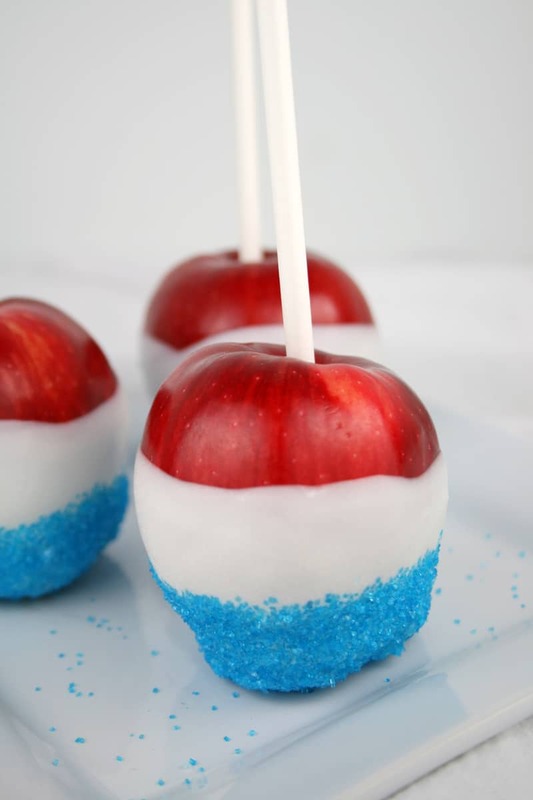 Candy coated apples dipped in blue sprinkles. So cute, so easy and so yummy! They are also on the healthy side. 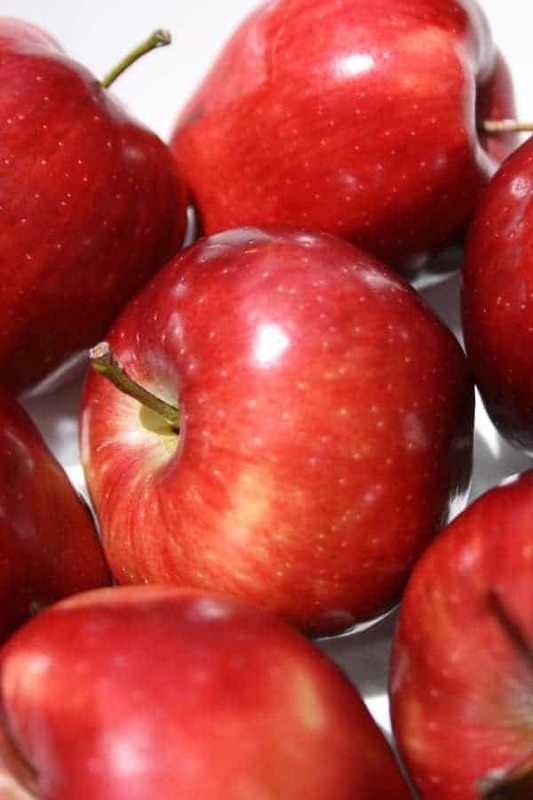 Candy coated apples are less caloric than cupcakes, plus you get a serving of fruit. Here are the 3 ingredients. 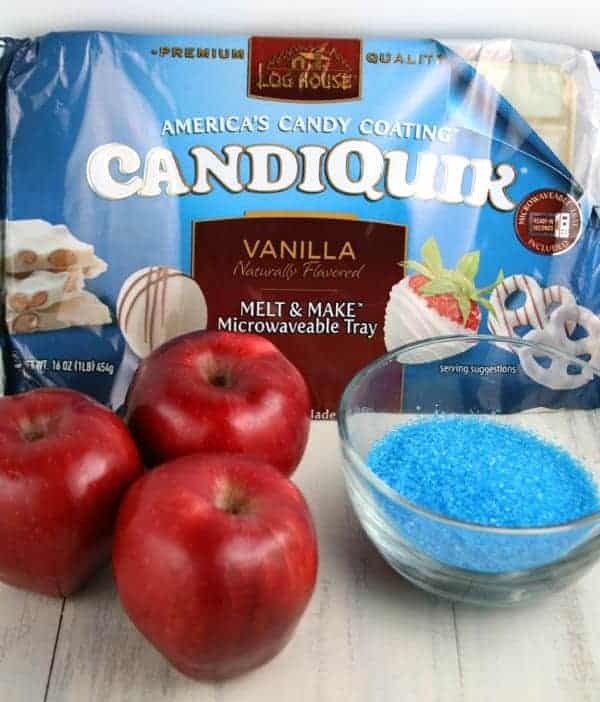 Apples, vanilla candy coating and blue sprinkles. I found the cutest apples at Walmart today. It’s hard to tell from this close-up shot, but they’re much smaller than your average apple. By the way, do you like this sunbathed photo? I normally use artificial lighting for my food photography, but thought I’d use a little bit of the pretty sunshine today. I like it! Anyway, the first step in this simple recipe is to remove the stems from your apples. 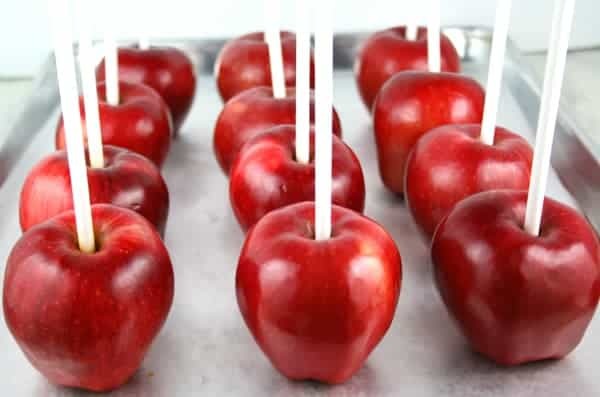 Then you press a lollipop or cookie stick into the top of the apple. You will have to apply a bit of pressure to get it in. I used Candyquick for this recipe. 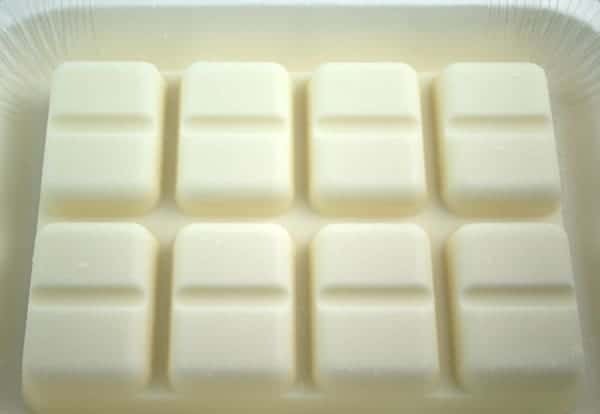 It’s basically a big block of white chocolate. I microwaved it in a glass bowl for about 2 minutes. 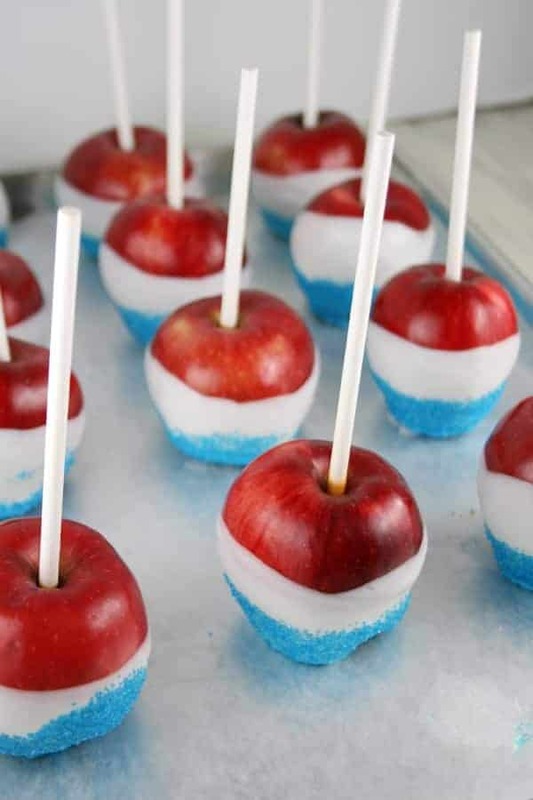 Then dip your apples in the melted candy coating. Don’t dip the apple all the way in, you want some of the red part to show. Then dip it in the blue sprinkles. 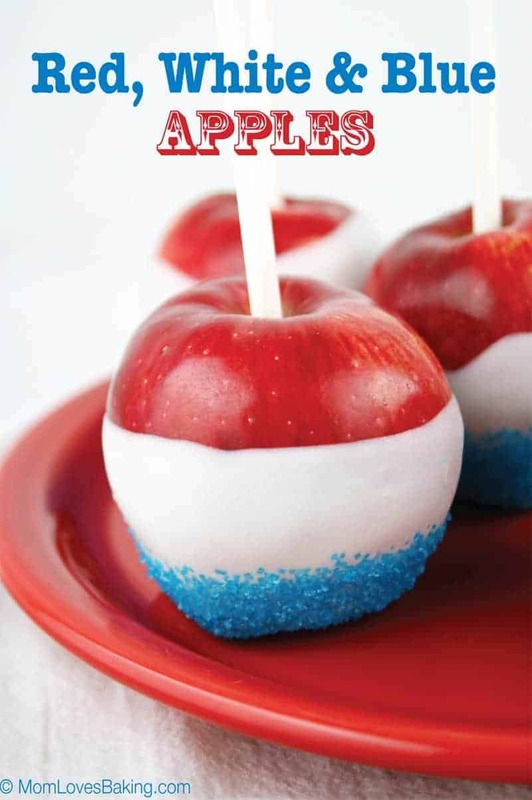 You can also hold the apple on it’s side and use a spoon to pour the sprinkles over the bottom section. It’s easier to get a straight line that way. Place apples on a cookie sheet lined with waxed paper. They will take about an hour to set. 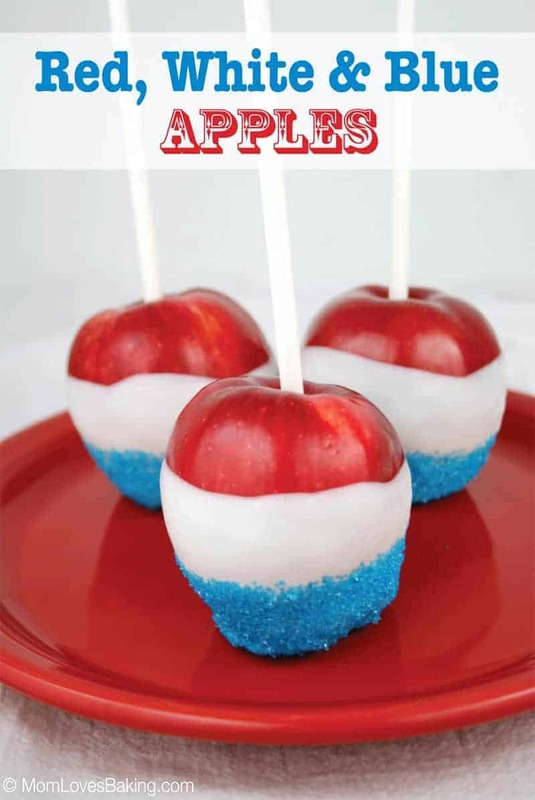 Are you going to make these for Memorial Day? I think you should. Have fun and enjoy! Wash and dry apples. Remove stems. Press sticks into the top of apples going almost all the way down but not all the way through to the bottom. Place candy coating in a medium microwave safe bowl. Microwave on high for 1-2 minutes. Stir until completely smooth. 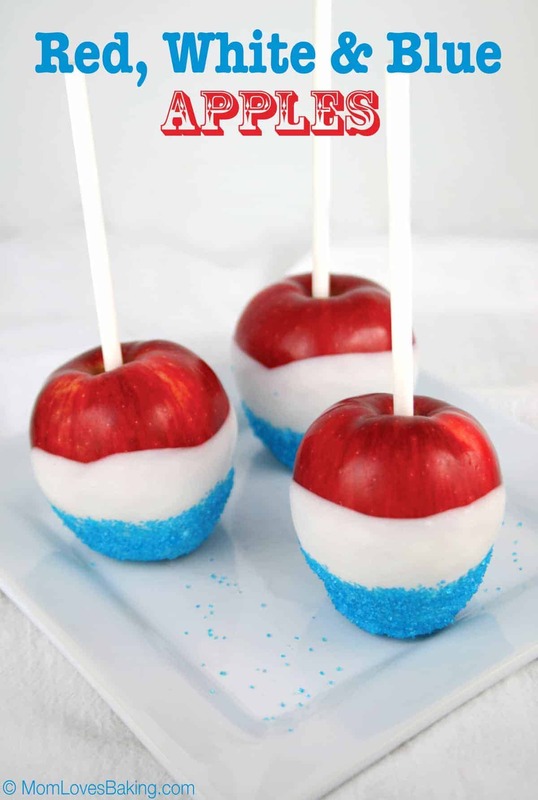 Dip apples into melted candy coating, leaving 1/3 of the apple with out candy coating at the top. (You want some of the red part of the apple to show.) 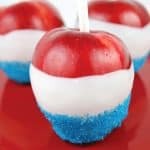 Let the excess candy coating drip off of the apple and back into bowl. 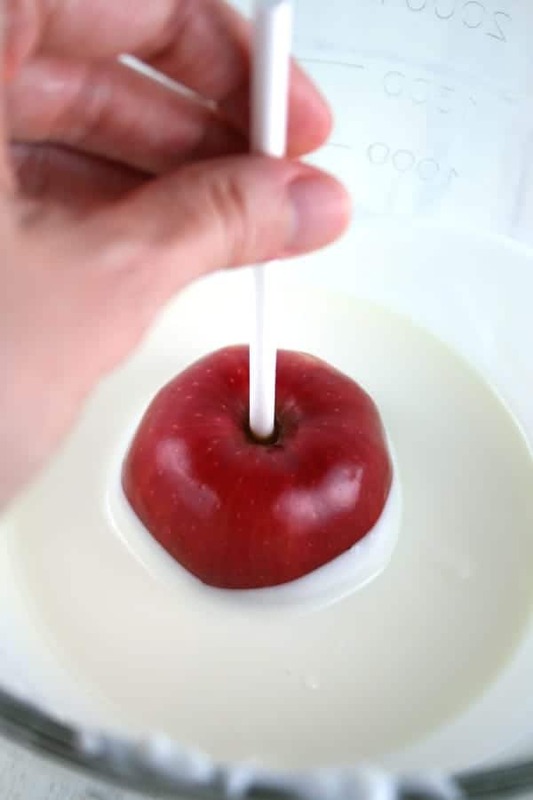 Use a spoon to brush off some of the extra candy coating from the bottom of the apple. Then hold the apple on it's side, over the bowl of sprinkles. 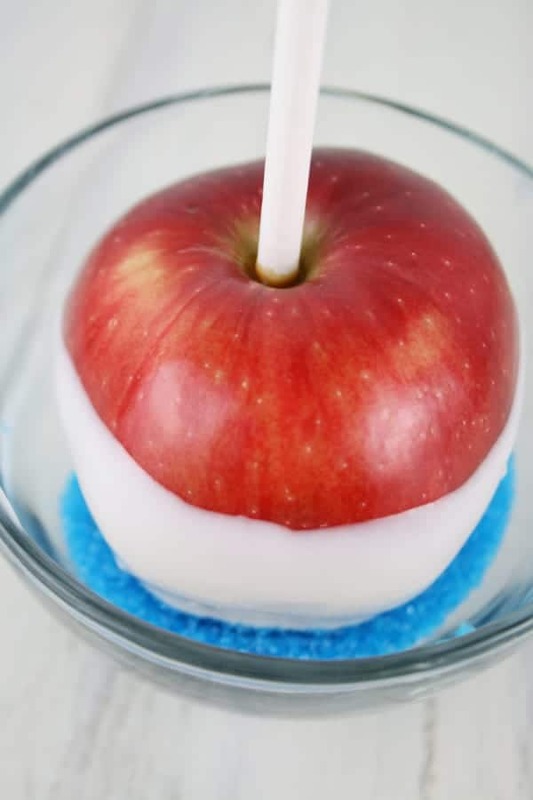 Use a spoon to pour some sprinkles over the bottom third of the apple in a straight line. Place dipped and sprinkled apples on prepared cookie sheet until set, about 1 hour. Serve or store covered in the refrigerator for up to 5 days. I love all of the creative treats that spawn from the holidays! These are too cute! Fun and looks easy! Great idea! Can these be made the day before and left at room temperature? Usually chocolate sweats after it is removed from fridge. Thanks!